Ferdinand Marie, Vicomte de Lesseps, GCSI (French: [də lesɛps]; 19 November 1805 – 7 December 1894) was a French diplomat and later developer of the Suez Canal, which in 1869 joined the Mediterranean and Red Seas, substantially reducing sailing distances and times between Europe and East Asia. 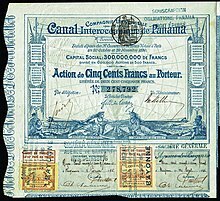 He attempted to repeat this success with an effort to build a Panama Canal at sea level during the 1880s, but the project was devastated by epidemics of malaria and yellow fever in the area, as well as beset by financial problems, and the planned de Lesseps Panama Canal was never completed. Eventually, the project was bought out by the United States, which solved the medical problems and changed the design to a non-sea level canal with locks. It was completed in 1914. The origins of de Lesseps' family are traceable back as far as the end of the 14th century. His ancestors, it is believed, came from Spain, and settled at Bayonne during the region's occupation by the English. One of his great-grandfathers, Pierre de Lesseps (Bayonne, 2 January 1690 – Bayonne, 20 August 1759), son of Bertrand Lesseps (1649–1708) and wife (m. 18 April 1675) Louise Fisson (1654–1690), was town clerk and at the same time secretary to Queen Anne of Neuberg, widow of Charles II of Spain, exiled to Bayonne after the accession of Philip V, and married on 7 January 1715 his great-grandmother Catherine Fourcade (2 June 1690 – 22 August 1760), by whom he had fourteen children, six of whom died in childhood: Dominique de Lesseps (1715–1794), Pierre de Lesseps (1716 – ? ), Marie de Lesseps (1717–1722), Arnaud de Lesseps (1719–1726), Jean-Barthélémy de Lesseps (1720–1795), Marcel de Lesseps (1720–1730), Jean-Pierre de Lesseps (1721–1721), Catherine de Lesseps, Gracy de Lesseps (1725–1791), Plaisance de Lesseps (1727–1735), Michel de Lesseps (1729–1801), married in 1769 to Florence Verdier (1739–1822) (parents of Louise Thérèse de Lesseps (1770–1866), married in 1788 to Mathieu Belland (1764–1817), Martin de Lesseps (1730–1807), married to Anna Caysergues (1730–1823) and had issue, Jeanne de Lesseps (1733 – ? ), married in 1759 to Alexandre Dubrocq, and Etiennette de Lesseps (1735 – ? ), married in 1761 to Pierre Simonin. From the middle of the 18th century the ancestors of de Lesseps followed diplomatic careers, and he himself occupied several diplomatic posts from 1825 to 1849. His uncle was ennobled by King Louis XVI, and his father was made a count by Emperor Napoleon I. His father, Mathieu de Lesseps (Hamburg, 4 May 1774 – Tunis, 28 December 1832), was in the consular service; his mother, Catherine de Grévigné (Málaga, 11 June 1774 – Paris, 27 January 1853), was Spanish on her mother's side, and aunt of the countess of Montijo, mother of the Empress Eugénie. She was a daughter of Henri de Grevigné (baptised Notre-Dame-aux-Fonts, Liège, 2 June 1744) and wife (m. Málaga, 1766) Francisca Antonia Gallegos (1751–1853). His first years were spent in Italy, where his father was occupied with his consular duties. He was educated at the College of Henry IV in Paris. From the age of 18 years to 20 he was employed in the commissary department of the army. From 1825 to 1827 he acted as assistant vice-consul at Lisbon, where his uncle, Barthélemy de Lesseps, was the French chargé d'affaires. This uncle was an old companion of Jean-François de La Pérouse and the only survivor of the expedition in which La Pérouse perished. Barthélemy de Lesseps had left the expedition in Kamchatka to travel to St Petersburg overland. In 1832 de Lesseps was appointed vice-consul at Alexandria. While the vessel, in which de Lesseps sailed to Egypt, was in quarantine at the Alexandrian lazaretto, M. Mimaut, consul-general of France at Alexandria, sent him several books, among which was the memoir written upon the previously filled and abandoned Ancient Suez Canal, according to Napoleon Bonaparte's instructions, by the civil engineer Jacques-Marie Le Père, one of the scientific members of the French expedition. This work struck de Lesseps's imagination, and was one of the influences that gave him the idea of constructing a canal across the African isthmus. Fortunately for de Lesseps, Muhammad Ali, the viceroy of Egypt, owed his position in part to the recommendations made on his behalf to the French government by Mathieu de Lesseps, who was consul-general in Egypt when Ali was a colonel. Because of this, de Lesseps received a warm welcome from the viceroy and became good friends with his son, Said Pasha. Politically, the British were allied with the Ottoman capital in Constantinople - to prevent the Russians from Black Sea access to the Mediterranean Sea - and had also repelled Ali's attempt to invade the Ottoman capital in 1833. The French were able to maneuver in Egypt under Ali's graces by playing off the British aggression against Ali in Constantinople. In 1833 de Lesseps was sent as consul to Cairo, and soon afterwards given the management of the consulate general at Alexandria, a post that he held until 1837. While in Egypt he encountered and was influenced by Barthélemy Prosper Enfantin, who was working on a barrage north of Cairo for Ali while preaching for a marriage of the Mediterranean and Red Seas. While he was there an epidemic of plague broke out and lasted for two years, resulting in the deaths of more than a third of the inhabitants of Cairo and Alexandria. During this time de Lesseps went from one city to the other with zeal and energy. Towards the close of the year 1837 he returned to France, and on 21 December married Mlle Agathe Delamalle (Garches, Hauts-de-Seine, 15 October 1819 – Paris, 13 July 1853), daughter of the government prosecuting attorney at the court of Angers. By this mariage de Lesseps became the father of five sons: Charles Théodore de Lesseps (1838–1838), Charles Aimé de Lesseps (1840–1923), Ferdinand Marie de Lesseps (1842–1846), Ferdinand Victor de Lesseps (1847–1853) and Aimé Victor de Lesseps (1848–1896). In 1839 he was appointed consul at Rotterdam, and in the following year transferred to Málaga, the ancestral home of his mother's family. In 1842 he was sent to Barcelona, and soon afterwards promoted to the grade of consul general. In the course of a bloody insurrection in Catalonia, which ended in the bombardment of Barcelona, de Lesseps offered protection to a number of men threatened by the fighting regardless of their factional sympathies or nationalities. From 1848 to 1849 he was minister of France at Madrid. In 1849 the government of the French Republic sent him to Rome to negotiate the return of Pope Pius IX to the Vatican. He tried to negotiate an agreement whereby Pope Pius could return peacefully to the Vatican but also ensuring the continued independence of Rome. But, during negotiations, the elections in France caused a change in the foreign policy of the government - Alexis de Tocqueville replaced the previous foreign minister. His course was disapproved; he was recalled and brought before the Council of State. Louis-Napoleon needed a scapegoat and Lesseps was an easy target. Lesseps was accused of causing dishonor to the French army and was censured although he was not told to leave the Foreign Ministry. Caricature of de Lesseps by André Gill, 1867. De Lesseps' statue now stands in Port Fouad shipyard. When it stood at the entrance of the Suez Canal, the outstretched hand indicated that the way was now open to the East. Lesseps had corresponded at least once with the Société d'Études du Canal de Suez during the reign of Abbas I in Egypt, but Abbas had closed off most of Egypt to foreign influence. Upon Abbas' assassination in 1854, Lesseps, made inquiries with a former, if short-term, acquaintance and successor in Egypt, Said Pasha. On 7 November 1854 he landed at Alexandria; on the 30th of the same month Said Pasha signed the concession authorizing him to build the Suez Canal. A first scheme, initiated by de Lesseps, was immediately drawn out by two French engineers who were in the Egyptian service, Louis Maurice Adolphe Linant de Bellefonds called "Linant Bey" and Mougel Bey. This project, differing from others that were previously presented or that were in opposition to it, provided for a direct link between the Mediterranean and the Red Sea. After being slightly modified, the plan was adopted in 1856 by the civil engineers constituting the International Commission for the piercing of the isthmus of Suez. Encouraged by the engineers' approval, de Lesseps no longer allowed anything to stop him. He listened to no adverse criticism and receded before no obstacle. Neither the opposition of Lord Palmerston, who considered the projected disturbance as too radical and a danger to the commercial position of Great Britain. De Lesseps was similarly not deterred by the opinions entertained, in France as well as in England, that the sea in front of Port Said was full of mud which would obstruct the entrance to the canal, and that the sands from the desert would fill the trenches — no adverse argument could dishearten Lesseps. De Lesseps succeeded in rousing the patriotism of the French and obtaining by their subscriptions more than half of the capital of two hundred million francs which he needed in order to form a company, but could not attract any substantial capital contribution from the public in England or other foreign countries. The Egyptian government thus subscribed for eighty million francs worth of shares. While in the interests of his canal de Lesseps resisted the opposition of British diplomacy to an enterprise which threatened to give France control of the shortest route to India, he acted loyally towards Great Britain after Lord Beaconsfield acquired the Suez shares belonging to the Khedive, by admitting to the board of directors of the company three representatives of the British government. The consolidation of interests which resulted, and which was strengthened by the addition in 1884 of seven more British directors, chosen from among shipping merchants and business men, increased, for the benefit of all concerned, the commercial character of the enterprise. De Lesseps accepted the presidency of the French committee of Leopold II of Belgium's International African Society. From this position he facilitated Pierre Savorgnan de Brazza's explorations, and acquired stations that he subsequently abandoned to the French government. These stations were the starting-point of French Congo. He was elected a Foreign Honorary Member of the American Academy of Arts and Sciences in 1879. In February 1880, de Lesseps arrived in New York City to raise money for the project. When he stayed at the Windsor Hotel, its staff flew the French flag in his honor. He met the American Society of Civil Engineers and the Geographic Society while touring the area. De Lesseps then went to Washington D.C., met with President Rutherford Hayes, and testified to the House Interoceanic Canal Committee. He later went to Boston, Chicago, and several other American cities to raise interest and capital for the project. In June 1880, de Lesseps gave a speech in Liverpool where he was able to find support from a Captain Peacock, who felt the canal project was worth supporting as it would provide routes to save time. Jacques du Bouays de La Bégassière, married to Joyce Blaffler, with issue. Yvonne de Contades (b. 1928), married on 27 January 1951 to Bernard, Count of Harcourt (1925–1958; son of Bruno, Count of Harcourt and Princess Isabelle of Orléans), with issue. Antoine de Contades (b 1932), married on 15 November 1963 to Daphne Jean Jefferson, with issue. A son Yves de Contades. Count Jacques Benjamin de Lesseps (1883–1927), aviator, married Grace McKenzie 1911. In 1956 Egyptian President Gamal Nasser used his name in a radio speech, as the codeword to his army to raid the Suez Canal Company's offices on 26 July 1956. This was the first step to the Suez Canal's nationalization. In the course of the raid and seizure of the canal by Egypt, the statue of de Lesseps at the entrance of the Suez Canal was removed from its pedestal, to symbolize the end of European ownership of the waterway. The statue now stands in a small garden of the Port Fuad shipyard. De Lesseps was portrayed by Tyrone Power in the 1938 film Suez, with Loretta Young, a film which provoked complaints and legal action from de Lesseps' family and the Egyptian government. In addition, Manuel Soto played the part in a 1944 Spanish feature film, Eugenia de Montijo. On television, Guy Marchand played de Lesseps in the 1983 French/German mini-series L'homme de Suez, and John Walters portrayed him in "The Panama Canal", an episode of the 2003 BBC docu-drama series Seven Wonders of the Industrial World. De Lesseps appears as a great engineer in the game Civilization V.
De Lesseps is also discussed extensively in the David McCullough book, The Path Between the Seas. ^ Karabell, Zachary (2003). Parting the desert: the creation of the Suez Canal. Alfred A. Knopf. p. 43. ISBN 0-375-40883-5. ^ Karabell, Zachary (2003). Parting the desert: the creation of the Suez Canal. Alfred A. Knopf. pp. 31–37. ISBN 0-375-40883-5. ^ Karabell, Zachary (2003). Parting the desert: the creation of the Suez Canal. Alfred A. Knopf. p. 63. ISBN 0-375-40883-5. ^ "Book of Members, 1780–2010: Chapter L" (PDF). American Academy of Arts and Sciences. Retrieved 23 September 2016. ^ Parker, Matthew. Panama Fever: The Epic Story of One of the Greatest Achievements of All Time – the Building of the Panama Canal. New York: Doubleday, 2007. pp. 81-84. ^ Lesseps, Ferdinand de (June 1880). "Address on the Inter-Oceanic Canal Scheme". Foreign and Commonwealth Office Collection. This article incorporates text from a publication now in the public domain: Chisholm, Hugh, ed. (1911). "Lesseps, Ferdinand de" . Encyclopædia Britannica. 16 (11th ed.). Cambridge University Press. pp. 494–496. Karabell, Zachary (2003). Parting the Desert: The Creation of the Suez Canal. New York: Knopf. ISBN 978-0375408830. 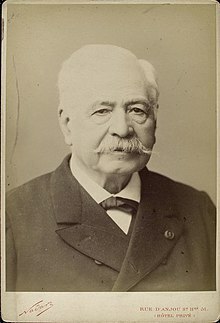 Wikimedia Commons has media related to Ferdinand de Lesseps. Ferdinand de Lesseps (1887). Recollections of forty years. Volume 1. Volume 2. From Internet Archive.